Grid-tied or On-grid solar system: An electrical system comprised primarily of a roof or ground mounted PV array and inverter, which are connected to and interact with the utility grid. Other devices called over current protection devices or OCPD are used for safety. Energy from the PV array goes fist to household loads and any extra power is stored on the utility grid. While you're talking to SEDA and the utility company (TNB, SESCO, SSB), ask them for their "interconnection agreement." This is essentially the contract you'll enter with them when you connect PVs to their grid. Once you know your average kwh/day usage you can plug this number into simple calculations to determine system size and cost. Tools like Google Android Apps, solar pathfinders and sun charts can be used to find out if that big tree across the street will shade the PV array in December/January. You might have more shade-free space than necessary or it could be the limiting factor in your system's size. 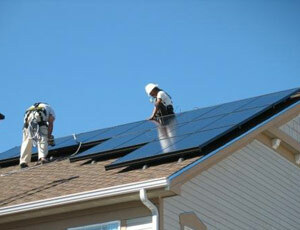 Project budget: Solar electric systems are not cheap and usually cost more than expected. Modest systems start at around RM45,000 but the majority fall in the RM60,000 to RM100,00 range. There are government incentives and rebates to take advantage of that will significantly decrease out of pocket costs. It may not be possible to produce 100% of the energy you use and many systems are supplemental, producing as much as space and/or budget allow. Please see SEDA for Feed In Tariff (FIT) detail. We used to see an average cost of a grid-tied system to be about RM15,000 per kilowatt (array size) installed, but with a growing market, systems are being installed for as low as RM12,000 per kilowatt in competitive areas. Keep in mind that these costs are before any incentives or rebates are taken into account. When the FIT kick in, the return of investment (ROI) will be around 9 to 14 years depend on locations, solar systems, technologies and so forth. Hopefully this helped introduce you to some of the basic considerations needed before purchasing a solar electric system. There is far too much information to cover in a short guide and anyone serious about greener living should contact us at contact@solarpower-mart.com or SEDA for more detail. 1) Malaysia only has 4 hours solar insolation (some areas may be less due to pollution). 2) Malaysia has average of 2 months cloudy/raining day per year, which solar power is not favourable. 3) When solar cell (module/panel) heat up (after noon time), the solar cell's efficiency (power output) will start to drop. Which mean during a hot day, solar panel (PV) actually produce less. This is a major challenge for solar power in Malaysia. 4) Every few months, installed solar panels (array) need to be clean (due to dusk accumulation on the panel) for maximum efficiency. This is an extra cost for the owner and may increased longer payback period. Please also find out other maintenance costs.